Why did it take 15 months for the U.S. to target the Islamic State’s oil infrastructure? U.S. air strikes targeting ISIS oil assets are so rare that PBS was caught using footage of Russian fighter jets bombing an oil storage facility in Syria and passing it off as evidence of the U.S. targeting the Islamic State’s oil infrastructure. U.S. military pilots have also confirmed that they were ordered not to drop 75 percent of their ordnance on ISIS targets because they could not get clearance from their superiors. Earlier this year a document emerged confirming that the Pentagon foresaw the rise of ISIS and that western support for Al-Qaeda groups and other anti-Assad rebels in Syria would lead to the emergence of a “Salafist Principality” that would help to “isolate” Assad. The New York Times is also reporting that US Central Command may have engaged in a year long effort to deliberately conceal the fact that the United States’ plan to demolish ISIS was not effective. Evidence also continues to emerge that ISIS is receiving support from state sponsors of terror like Turkey and Saudi Arabia. 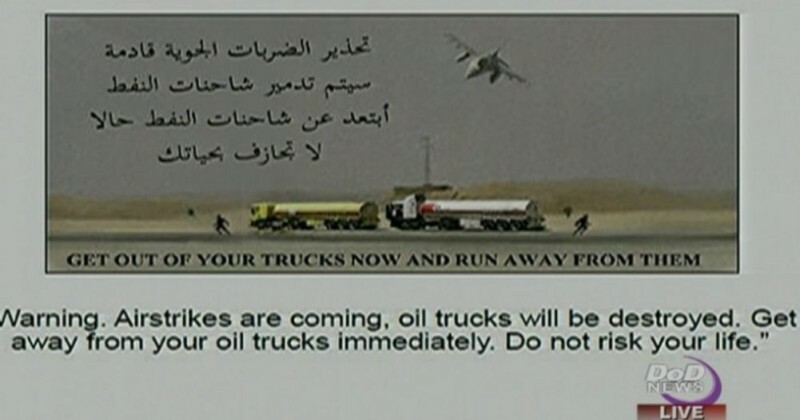 $800,000,000 worth of ISIS oil has been sold in Turkey, a supposed U.S. ally. ISIS trucks are routinely allowed to cross back and forth between the Islamic State stronghold of Raqqa and Turkey, while the NATO country facilitates black market oil sales on behalf of the terror group.